in our weekly e-newsletter, or on our website. 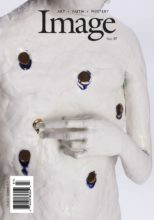 Image is a quarterly literary and arts journal which stands at the crossroads of faith and imagination. It is unique among literary publications not only for its focus on religion and art, but for its high production values. Image’s impact is directly related both to its content and to its outstanding graphic design. Readers see text printed on acid-free paper and visual art reproduced through the four-color process. Image features fiction, poetry, memoir, and interviews, as well as essays on painting, sculpture, architecture, music, dance, and theater. In twenty years, Image has become a dynamic force not only in religious circles but in the American public square. It stands at the forefront of the growing movement of those who embrace the spiritual dimensions of art. Image is distributed in Barnes and Noble across the country, many independent and university bookstores, and on the Zinio digital reader platform alongside other major literary journals. Contact our advertising representatives for most current circulation numbers. Send a PDF at 300 dpi (or 600 dpi for line art) with embedded fonts. Agency discount: 15%. No cash discounts. Payment due 30 days from date of invoice. Space cannot be canceled after copy deadline. All copy subject to approval of publisher. Reservations and artwork for the outside back cover are due two weeks earlier than below. ImageUpdate is a free, weekly e-newsletter for those who want to stay connected to the world of art & faith. Each issue includes reviews of books, albums, artists, gallery openings, and more, recommendations from the Image staff, and a community message board with job postings, calls for papers, conferences, classes, and other offerings. More than 7,700 people receive ImageUpdate in their inbox every week. For details and to reserve your ad placement, email Sue Milnes at suem@pma-inc.net. The Image website is an ongoing resource for people who care about religion and the arts–and who are interested in books, music, art, events, and educational programs at the intersection of faith and culture. Advertising on the Image website is a great way to promote to this highly specialized audience. Ads appear on the side of all journal article pages and blog posts. All ads are subject to our approval. Please check to make sure your ad is legible at this size.